Hartington Hall is a seventeenth century manor house set in lovely open countryside overlooking the Dove and Manifold Valleys, on the hillside just outside the village of Hartington. It was built in 1611 by the Bateman family as their residence. By 1817 it was occupied as a farmhouse. The first baronet, Sir Hugh Bateman of Hartington Hall, passed away in 1824 in his 68th year and was buried at All Saints', Derby on 7 February. The hall was restored in 1862, "at a cost of several thousand pounds", by T. Osborne Bateman, Esq., J.P. of Derby. His son, Mr. Frederic Osborne Fitzherbert Bateman who was born in Chaddesden in 1860, later lived in the house, after selling his home at Breadsall Mount and is first mentioned there in Kelly's 1912 Directory. His family had by then owned Hartington Hall for four centuries. He died at the Hall on 13 April 1917 and was survived by his widow, Evelyn Mary. Towards the end of 1918 Sellers and Son of Ashbourne offered Hartington Hall for lease. It was furnished and the lease was available either with or without the Horse Farm. In May 1921 it was announced that Mrs. Bateman had let the property to Mr. Alfred Cochrane, the eldest son of the late Rev. David Cochrane who had been the vicar of Etwall. Thirteen years later Hartington Hall became a youth hostel, opening in March 1934. A newspaper report mentioning the official opening said it would be "added to the Derbyshire chain, which is claimed as the best in the British Isles". The North Midlands Regional Council had arranged the rental and the building was said to have been converted into the most up-to-date establishment of its kind in the country. It had electric lights and central heating, with accommodation for 70 people. The project had been given a grant by the Carnegie Trustees. Hartington Hall was subsequently purchased by the Youth Hostels Association. The message on the back of the postcard, written in 1908, reads: "This is the house we are staying at. It is all very pretty but very cold. I have not been to fish yet". Derbyshire's Parishes, 1811, Parishes H, which has much more about the village. 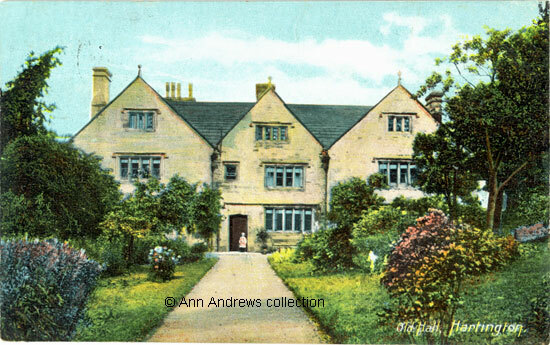 "Old Hall, Hartington". No publisher. Posted 18 Apr 1908 at Hartington. Postcard in the collection of, provided by and © Ann Andrews. Lysons, Rev Daniel and Samuel Lysons Esq. (1817) "Topographical and Historical Account of Derbyshire" London: Printed for T. Cadell, Strand; and G. and A. Greenland, Poultry. "Derby Mercury", 4 February 1824. Announcement of death. His Will, held by the National Archive, was proved in the Prerogative Court of Canterbury on 28 May 1824 (PROB 11/1685/361). "Black's Tourist Guide to Derbyshire" (1864) pub. Adam and Charles Black, Edinburgh, edited by Llewellynn Jewitt. "Derbyshire Advertiser and Journal", 20 April 1917. Death of Mr. F. O. F. Bateman. Also national Will and Probate records. "Derbyshire Times", 23 October 1886. Announcement of the marriage of Frederic Osborne Fitzherbert Bateman, of Breadsall Mount, and Hartington Hall, to Evelyn Mary, eldest daughter of Major Wilkinson of Scarborough. The marriage took place on 14th October at St. Martin's Church, Scarborough. "Derbyshire Advertiser and Journal", 1 November 1918. "Derbyshire Advertiser and Journal", 14 May 1921. "Derby Daily Telegraph", 23 March 1934. Hall As Youth Hostel. Memories of The Bateman Family. "Derby Daily Telegraph", 25 August 1950. Y.H.A. Coming of Age.